Gladstone is a suburb of Kansas City, Missouri. It is in Clay county and has a population of about 26,000. Gladstone is now completely surrounded by Kansas City and the informal nickname of this city is Happy Rock. This city is in Tornado alley which receives several tornado hits per year, and we’re here to help with any foundation repair your home may need after tornado damage. KC Pro is a full foundation repair company. We are your premium service provider of basement waterproofing, concrete repair and installation, mudjacking, and foundation repair. When your home needs to be fixed, we provide you with quality work that is done quickly but holds permanently. Details matter with your home because it is what keeps you safe from storms and keeps a roof over your head for shelter so it needs to be sturdy. If you find that your home is having foundation problems such as cracks, leaning walls or chimneys, or a sinking foundation, then you need to have a professional take care of the issue. KC Pro can solve your foundation repair problems here or in the surrounding areas to keep your home safe and sound for everyone. Soil-related disturbances tend to be a large factor when needing foundation repair. Poor compaction, overloading, and excessive materials that expand and shrink with the changes in the moisture content greatly impact the amount of stress on your home’s foundation. With our helical and steel piers we will return your home to the best condition possible. KC Pro has several foundation repair systems to overcome the damage already done. Water seepage is often the result of a poorly maintained and dilapidated foundation. Water will take the path of least resistance, so if your foundation has cracks, chances are you’ll have waterproofing issues. With the right waterproofing contract company, you’ll be able to make sure that your home stays dry during the wettest of weather. Along with the foundation repair services KC Pro has to offer, our professionals can also provide you with basement waterproofing services as well. If you are in need of exterior or interior waterproofing, sump pump or sump basin installation, crawl space repair or waterproofing, or wall crack injections; then we are the company to contact. We are a trusted foundation repair and basement waterproofing company, so you will not be disappointed in our repair services. 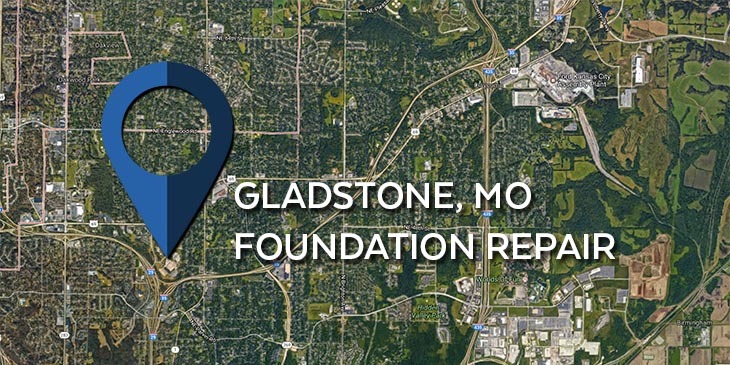 If you are in need of foundation repair in Gladstone MO or in any of the surrounding areas, then contact us today!